Nearsightedness, infection or injury such as a hard solid blow to the eye, can also make the vitreous separate. It is more common in people with a family history of retinal detachment. When there is a hole in the retina, fluid from the vitreous space may pass through the hole and flow between the retina and the back wall of the eye. This can separate the retina from the back of the eye and cause it to detach. The detached part of the retina will not work properly, and you will see a blurry or blind spot in your field of vision. Most retinal detachments are a result of a retinal break, hole, or tear. Most retinal breaks, holes, or tears are not the result of trauma but are due to preexisting factors such as high levels of myopia, prior ocular surgery, and other eye diseases. Flashing lights and floaters may be the initial symptoms of a retinal detachment or of a retinal tear that precedes the detachment itself. Early diagnosis and repair of retinal detachments are important. The surgical repair of a retinal detachment is usually successful in reattaching the retina. The retina is an extremely thin tissue that lines the inside of the back of the eye. When we look around, light from directions enters in to the eye. The light image is focused onto the retina by both the cornea and the lens. This light striking the retina causes a complex biochemical change within layers of the retina. And this, in turn, stimulates an electrical response within other layers of the retina. Nerve endings within the retina transmit these electrical signals to the brain through the optic nerve. This electrical energy is received by brain and processed to allow us both to see and to understand what we are seeing. The retina, in contrast, continually renews itself chemically and electrically. And allowing us to see millions of different images every day without them being superimposed. Research have shown that the incidence of retinal detachments caused by tears in the retina is very low. Affecting approximately one in 10,000 people every year. Many retinal tears do not progress to retinal detachment. Retinal detachments can occur at any age but are most common in adults 50 years and older. Specially those who are highly nearsighted or myopic and in older people following cataract surgery. What other factors are associated with a retinal detachment? Blunt trauma, like penetrating injury by a sharp object to the eye can lead to a retinal detachment. In some patients with a non-traumatic retinal detachment of one eye, a detachment subsequently occurs in the other eye. Accordingly, the second eye of a patient with a retinal detachment must be examined thoroughly every year, both by the patient and the ophthalmologist. Non-rhegmatogenous retinal detachments is another kind. This kinds are not as a result of a retinal break, hole, or tear. These include conditions known as exudative retinal detachments and tractional retinal detachments. 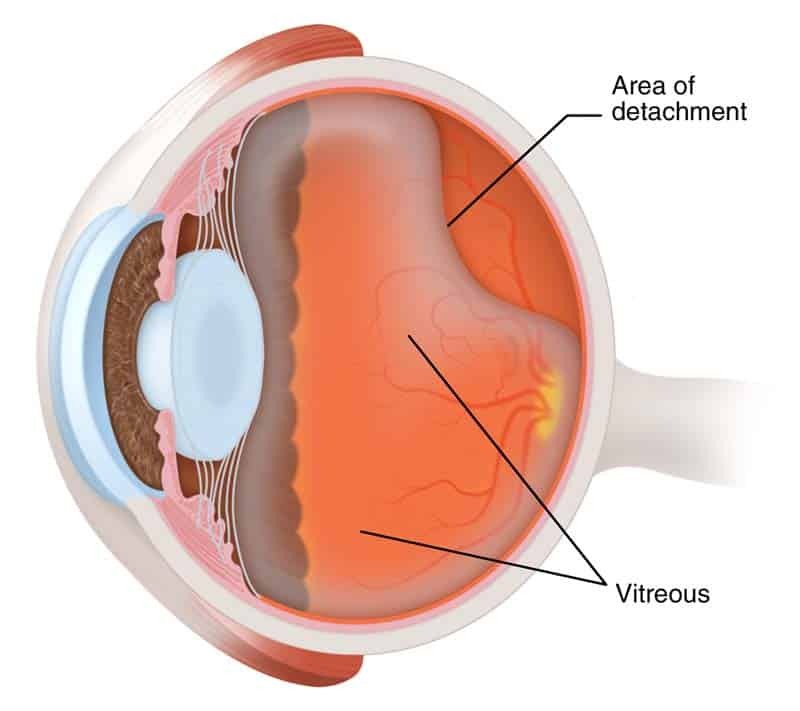 If the retina is torn, you may be able to stop detachment by receiving the tear treated quickly. If there is a little or no detachment at all, tears can sometimes be sealed with a laser. The laser makes small burns to seal the edges of the tear. This can be done without a hospital stay. Freezing is another way of sealing the edges of the tear. But you will need a local anesthetic to numb the eye. No need to stay in hospital. If the retina is detached, you will need surgery. In over 92% of cases, retinal detachment can be treated successfully. Sometimes, more than one operation is needed. Sometimes the ophthalmologist has to drain fluid so the retina can settle onto the back wall of the eye. In more complicated cases, a procedure named a ‘vitrectomy’ is done. This involves cutting the vitreous away from the retina and taking it out of the eye. About 40% of people who have their detachment successfully repaired have excellent vision within 6 months of surgery. The results are not usually as good when the retina has been detached for a long time or when there is a fibrous growth on the surface of the retina. Please remember getting yearly eye examination by optometrist is very important. 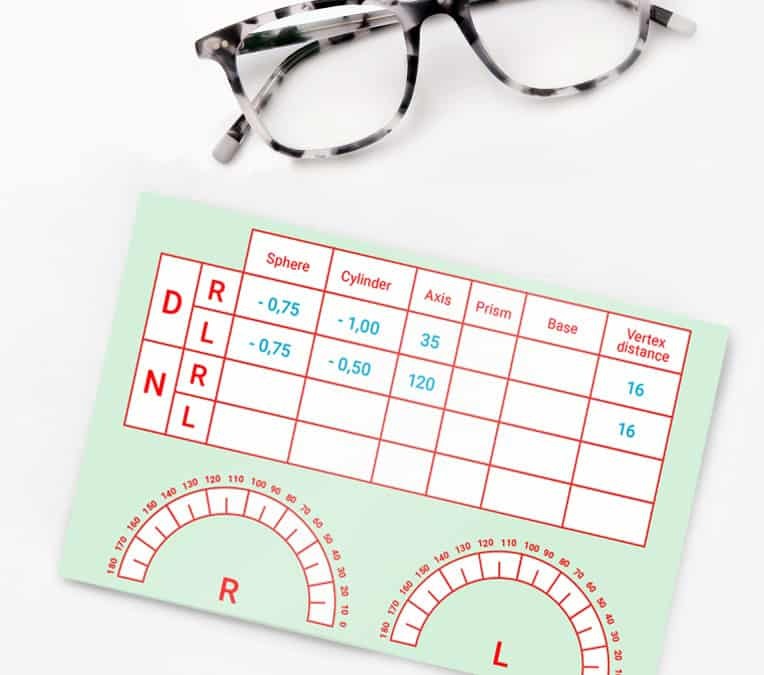 What is an eyeglass prescription?